PARIS--Hotel rooms go unoccupied. It's a common occurrence as rooms turn over from night-to-day. What if you could consistently fill those empty rooms during daytime hours? Dayuse.com, a daytime hotel booking platform based here, wants to help national and international hotels increase their revenues by filling the rooms that would otherwise go unoccupied. Hotel brands may feel like this is simply the cost of doing business in the industry, but it's a price they should not have to pay, according to Lorenzo Sciotti, U.S. head of sales, Dayuse.com. For guests with long layovers in need of a place to crash or people on a staycation who wish to enjoy the amenities of a local hotel for a few hours, the team at Dayuse.com aims to support the growing needs of these travelers, too. Dayuse.com uses an untapped market to commercialize hotel rooms during the day. We work hotels to monetize add-ons such as the property's spa facilities and pool. It's a great service for a group of friends who just want to relax at a hotel without taking off several days, which can be more difficult to do, said Sciotti. Globally, we are globally the only company providing this type of service. In Europe, we work with Marriott and other chains as well. We are reaching out to create an offer here in the U.S. as we did in Europe. We have a background in hospitality and we understand how hotels work. All of the offers are tailor made for the hotel and, as a result, we have received a positive response. The different services a hotel can provide and their rates are competitive. To fill the rooms and entice travelers, rates on Dayuse.com are slightly less expensive--up to 70% off--compared to a traditional overnight stay. Occupancy is our goal. We advertise the time slots and available minimum hours. It's about creating the right offer. We need to understand how the hotel organizes housekeeping and other operations. It's a win-win service that won't impact overnight activity and creates a revenue stream for the hotel, he said. Working hand-in-hand with the property, Dayuse.com will create an offer and provide additional support in the form of detailed monthly reports to make sure the hotelier is satisfied with the proposed time slot and volume to achieve the highest possible revenue. We adapt to the organization. We don't ask them to change anything. They only have to worry about turning those rooms around. We work with various properties--small, boutique or chain--and we personalize the service for them, he said. 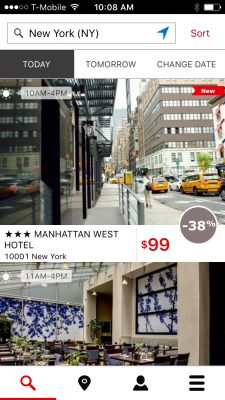 Sciotti believes Dayuse.com is the answer to what ails the hospitality industry--disruptors such as sharing economy websites and OTAs--by bringing back value to hoteliers and enabling them to reclaim lost market share. What's happening in the industry is troublesome. We are a solution with no impact on the current organization and it's a great opportunity. We don't compete with hotels or major OTAs. We see it as an additional revenue perspective, he said. Launched in 2010 and powered by an infusion of funding, Dayuse.com has set its sights on growth in the U.S. and other key markets. Dayuse.com closed on a $17 million (15 million euros) Series A investment round at the end of 2015. We plan to open 10 new markets in New York, Australia and South Africa with a focus on hotel rooms and their facilities. The direction we will take is commercializing all of the services a hotel can offer, he concluded.